Welcome to the BioSurplus Flow Cytometry FAQ. Here we explain the basics and various types of flow cytometers. Flow cytometers come in two basic types, the ones that only count cells, whether labeled or not, and the ones that both count and sort the counted cells. Sorting has the advantage of isolating particular cells for further study away from the non-labeled of cells. Flow Cytometers are used for cell counting & sorting. 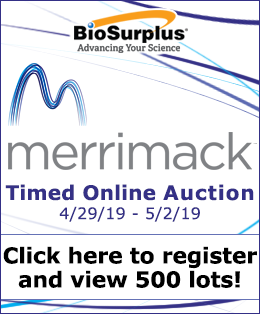 BioSurplus has these instruments used for Flow Cytometry for sale with a wide range of features, a few of which are discussed here. Flow cytometers are generally used with large cell populations that are specifically labeled with a fluorescent dye, tag, marker or label for the target of the research. It allows either the counting of how many of the total cells were targeted and received the label, or the counting and sorting of that labeled cell away from the non-labeled cells. Other instruments that are similar can perform slightly different functions, so if the requirement is only to count the total number of cells, a simpler dvice can be used, such as a Beckman Coulter Z2 or even a microscope with a hemocytometer slide. There are also specific instruments that use Coomassie blue stain or other labels to sort live versus dead cells, such as the Cedex Innovatis. Newer developments in flow cytometers include products such as the Amnis Imagestream, which can also take high resolution photographs of individual cells as they flow by, allowing localization of the dye not only to the cell but also to specific parts of the cell, suchas the nucleus or endoplasmic reticulum etc. Flow cytometers generally use lasers to activate the fluorescent tags on the cells that are in the population of interest. Computers with instrument specific software count and sort the cells of interest based on user entered parameters. Complex flow cytometer systems can have multiple lasers and filters allowing different dyes to be counted. This allows for multiple targets in the same population to be counted and/or sorted, or for populations only expressing both markers versus just one or the othr to be analyzed. Flow cytometers function by using a sheath fluid under pressure as a carrier to transport the sample through the instrument. The sheath fluid is generally a phosphate buffered saline or Hepes-buffered saline solution. Introduction of the sample is either manual or from an automated sample injector system. The sample travels with the sheath fluid which helps align and pass the cells in single file to the measurement flow cell, where the cell marker is usually activated by a laser. The instrument mesures the light output of the cells passing through the flow cell, and separates the cells according to user entered parameters. The most common laser is 488nm, allowing for a wide variety of stains or tags that emit light in this range. A 488nm laser is often referred to as a blue colored laser. Although the 488nm laser is common, lasers can emit light from the UV spectrum all the way into the infrared spectrum, about 350nm (UV) to 800nm (infra-red). Early lasers, ie approximately before the year 2000, had significant power requirements, usually 240V systems with high amperage, and needed significant water cooling to keep them operating. More recently diode lasers have become available, which are highly favored over water cooled lasers. While these lasers vary significantly in price and can be more expensive than traditional water cooled lasers, their lifetime maintenance costs for both electricity and water usage are significantly cheaper, and te space requirements are significantly less, making them industry favorites at this point in time. Red diode lasers are relatively cheap and generally quite small in size compared to other lasers, although their power output is reduced as well. Lasers generally vary in strength from approximately 5 mwatt to 200 mwatt or more for flow cytometry systems. The size of the nozzle used for sorting is related to the cell size, and the most common nozzles are 70um. Very specific nozzles can be used such as with the Beckman MoFlo, one of the few FDA approved systems used to sort sperm for animal husbandry. Using a UV laser and a patented oval shape and size nozzle, the nozzle is critical to sorting x and y sperm, a sort done primarily on the mass difference between the X and Y sperm. Cell sorting is primarily based upon charge or label difference, with the flow stream divided into three sections, the positively charged stream going to one side, the negatively charged stream going to the other side, and a neutral stream usually going to waste. Recent advances in flow cytometry also include the ability to sort single cells into 96 well plates, with one cell per well. This allows isolation of specific clones targeted with the appropriate dye from large populations with rare events. Sorting speed has increased significantly with instrument advances over the years, while still maintaining sorting accuracy. Early sorters prior to 1999 might have sorted cells on average at 10,000-25,000 EPS or Events per Second. Newer sorters can sort at over 100,000 EPS, allowing the sorting of rare event populations in significantly reduced time. While each instrument has its own proprietary software for instrument control and sorting functions, several software packages have developed in the third party market for analysis of the collected data. FlowJo is one such package and is freely available for downloading. Flow cytometers have taken advantage of computer chips and other technological breakthroughs such as diode lasers to allow them to shrink from the size of a large desk with a return to bench top models. Depending on the complexity required by the scientist, a flow cytometer can have the same footprint as a laptop computer for single purpose systems. More complex systems with multiple lasers are larger, but still bench top systems. 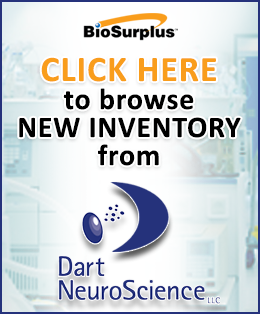 Flow cytometers as well as general cell counters are available for sale at BioSurplus. Please browse our online inventory or contact one of our sales representatives for further information and availability.